Food. Sustenance. Energy. Probably the most important elements driving any potential recovery you can make. So being fed something you can eat that fits the strict diet set by the powers that be; Hospital should be the one place the gets this spot on, right? Its supposed to be a Shepards Pie, but the essentially ‘jellied’ like meat reminds me more of what a Dog Food Pie would look like. 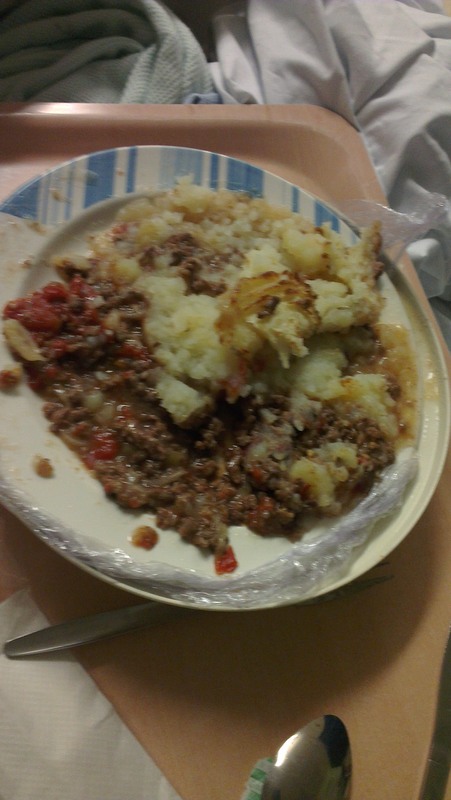 This is by no means the worst thing i’ve been served whilst trying to recover in hospital; But this is the meal that took my anger levels to a point enough of wanting to something about it. Having complained before and seeing little improvement, rather than relying on the Kitchen team to take pictures and share it with the Hospital heads of catering – I decided to take a picture of every meal I was served. To be fair this picture doesn’t do the meal justice. It was also cold, the mash potatoes were soggy, and see those massive clumps of red? Those are barely cooked tomatoes. I can assure you, for someone on a Intestinal Failure Menu, from which this was ordered from, big – high residue – acidic – cheap tomatoes are not only un-enjoyable at the point of eating. But for hours and hours after. I was in Hospital for a mere 3 weeks. And over the next 3 weeks I’ll be sharing more and more of the delicacies delivered to my hospital bedside, what protests I made and whether I ever did, get them to Feed Me Something Decent!